Defender Uwe Hunemeier believes victory at Middlesbrough today can help Brighton get some momentum back. The Seagulls have won just one of their last 13 Premier League games but did beat arch rivals Crystal Palace 2-1 in the third round of the FA Cup. Hunemeier feels a cup run will be positive for the club as it will give fringe players much-needed game time and also get a good feeling in the squad. He said: "For us who haven't played a lot, it's a chance to get another game if we win on Saturday. "We want to have another game. We want to win to get momentum back and to get back to winning ways. That's our target, we want to win. "It's the first game of a busy period, with a midweek game against Southampton and West Ham next weekend. "We want to start with a win to lift the mood. It's not bad, we played decent last weekend and were quite unfortunate with the result at 4-0 (against Chelsea). "If we'd scored in the first half and got one back, it could have been a totally different game. We took a lot of positives but at the end it was another defeat. "We have to look for wins and points but this is a good chance to start a busy period with a win." 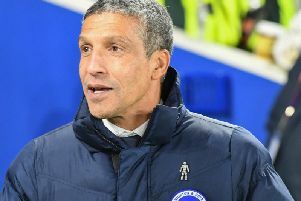 Albion are fifth from bottom in the Premier League and on the Seagulls' league form this season, Hunemeier said: "Right now, we are where everyone expected us. "We are on a bad run but all of the teams have had it or will have it later. Hopefully we can turn it around as soon as possible with important matches coming up. "Our main priority is to stay up. When you're used to winning games, it's not easy but we're strong enough to turn it around. "With the next four games coming up against opponents around us in the table, if we can get wins it's even better for us and hurts them more than if we beat a big team." Hunemeier, 32, has made just four appearances this season and on his lack of game time said: "As a footballer, you want to play as much as you can. "I push myself in training as much as I can. First of all I'm a team player, I want to stay up in the league. I want to push the boys to the highest level to stay up in the league. "Whenever the gaffer needs me, I want to perform. I'm looking for the success of the team, not my personal success."